Welcome to The Classic Motorcycle Co. Website! 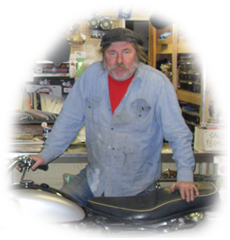 The Shop, located at 56 East Orchard St., Terryville CT, also houses the Tike's Paint Shop. I am Robert T. Ladd, proprietor of these establishments, that do business in the old Eagle Lock Company's boilerhouse. This is where you will find me and our showroom. Call us at (860) 585 - 5102 or stop in and see us! Here's the Flyer for the 2010 Britjam! - Here! Here's a flyer for the 32nd Annual British Motorcycle Meet - Sunday June 6th, 2010. And a flyer of the Connecticut Annual Summer Motorcycle Swap Meet - June 27th, 2010.